When Corey has a chance to buy an extremely rare Belgium-made 1942 Sarolea motorcycle, Rick has a big concern…making money. Will they pony up and make a deal or let one of the rarest bikes in America roll out the door? Then the Pawn Stars have a chance to buy a Civil War sword believed to have belonged to a Confederate officer. 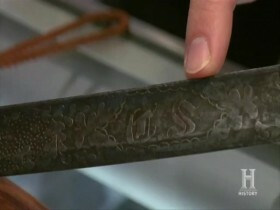 Will Rick go to battle for this piece of American history, or will its authenticity spark a pawn shop civil war? Then later a woman brings in a cast iron printing press from the 1800's. Will the Old Man ink an offer or invest in a Xerox machine instead?